If you sell on Amazon long enough, you’ll eventually run into a situation where you need to have inventory from an FBA warehouse returned to you. In order to get Amazon to return your inventory, you have to submit what is known as an FBA removal order. Submitting an FBA removal order can be done via seller central, and you have to pay a removal fee for each item. In this guide, we’ll cover three different ways that you can submit a removal order depending on the amount of inventory you need to have returned. Once you know exactly what to do, it’s an easy and relatively painless process. Why have FBA items returned to you? There are several different reasons why you would want to submit a removal order for inventory that is currently located in an FBA warehouse. 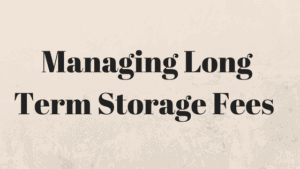 Avoiding long term storage (LTS) fees on products that have been in stock for 12+ months. Removing stranded inventory that can’t be resolved or you aren’t able to get back to “active” status. How much does an FBA removal order cost? Removal orders cost $0.50 per item for standard size items and $0.60 per item for oversize items. This is a flat fee to return items to the location of your choice. If you don’t want the inventory back, you also have the option of having it disposed for you. This costs $0.15 per item for standard size items and $0.30 per item for oversize items. There are three options to create a removal order that we use in our business. The first that we’ll walk through is a manual process when you have a relatively small number of items (~10 or less) that you need to remove. Each item is removed individually and this is not ideal for a large set of items. The second option is similar to the first but allows you to remove a larger number of items much more efficiently and without having to do them one by one. I wouldn’t recommend using this option for more than 250 items. The third option is a “bulk removal option” that is best if you have 250 or more units that you need to remove, and there are more than 50 unique items making up the 250+. This option is best suited for removals to avoid long term storage fees as this can involve removing many different products. We’ll walk through how to do all three below, and then you can use the process that fits the number of items you are looking to remove. Let’s get into the processes! Click on “Inventory” when logged into seller central and navigate to “Manage Inventory”. Then search for your item to remove. You can search by UPC, SKU, or title. After you do the search, locate the item and select the “Edit” button to open a drop down menu as shown in the screenshot below. This will take you to the removal screen as shown below. Make sure to enter in the correct quantities for fulfillable and unfulfillable (if any) and proceed by selecting “Continue”. Last step is to confirm the selection. Make sure to double check the “Method of Removal” and make sure that it says “Ship-to address” and not “Dispose” (unless you mean to destroy the items). Then select the “Place order” button. That’s it! You’re all set and Amazon will start to ship the items from your removal order back to you. Then search for your item(s) to remove. You can search by UPC, SKU, or title. After you do the search, locate the items and check the box on the left hand side of the screen next to the items you wish to remove. You can see an example in the screenshot below. Then search for your next item, and check the box next to the item. You can search for additional items, and the box next to the prior items will stay checked as well. You will not lose the items that have been selected when going from page to page. You will be limited however, to the first 250 items you have selected as a max in the next step. So make sure you don’t select more than 250 items or you will get an error message and have more work to do. Once all your items have been selected choose the button in the top left corner in the screen shot below that says, “Action on 250 selected” in the screenshot below. Note this is just an example, and when you are doing this the button should say the number of items you have selected. Note: The orange arrow above allows you to select all items on a single page instead of checking them all individually as the red arrows display. This feature is useful if you need to create a removal order for all items of a specific brand, or many products with the same word in the title. Here’s the default message that asks to confirm if you wish to remove multiple items. This will display every time you use this method (option 2). Choose, “Yes, continue” to move to the final steps. Once you get to the removal screen as we walked through in the quick removal process above, instead of entering in the removal quantities and processing the removal for this one item, we will want to click on the button that says, “Upload Flat File” as the red arrow displays. Note: This process is also referred to as uploading a “Flat File” if you hear anyone else mention this process in the FBA community. Once we get to the next page, we will want to download the template as shown. This is a continuation of the instructions that explains what the proper inputs are for entering in the fields you need to have a successful upload of the “Flat File.” Again, this info will be included in the excel template that you have downloaded earlier in this method. Here’s the final instruction page I wanted to show to make sure you use this as you create your own “Flat File”. This is a very helpful page, because this is a direct example for how your file should look before uploading the document back into seller central. This is the most helpful page in the template that you have downloaded and should be the format you follow. Save the file as a .txt file as shown below. Note: .txt files can only have one tab so make sure to remove the other tabs or copy the example sheet they gave you to a new Excel workbook to fill out with your information. Open the text file you saved, and make sure it saved properly with all information being accurate. Once you verify everything is accurate, it’s time to upload this file in seller central as shown in the next screenshot. This is the same screen where you initially downloaded the template file. Again please read this warning before uploading: *This method can affect a large number of items — Please make sure to check the file before uploading it for any issues or errors. This is also a way to dispose of items in bulk, so make sure you have RETURN included in the appropriate field in the file to make sure there aren’t any mistakes. After you have uploaded the file, it will start to process the information. To know that it has been uploaded successfully, you will want to see similar results to the file status as shown below. This means that all the items (143) were completed and there weren’t any errors found. If you do have errors, you’ll want to view the processing report under “Actions” which you can also see below and it should tell you what the issues were when attempting to create the removal order. That does it for bulk removal orders! One last tip I want to share is that to make sure the file has processed correctly, you can check in your orders report. Go to Orders > Manage Orders within seller central, and you should be able to review the removal order. You can do this check when using any of the 3 methods shared in this post. I highly recommend using this on all removal orders you create to verify they process correctly. If you have any questions about removal orders that weren’t addressed in this post, please comment below and we will do our best to answer them. If you are running an online retail business and haven’t checked out our Stairway to 7 Figures system yet, you should do that now. It is a blueprint for building a successful online business from scratch and covers topics like retail arbitrage, outsourcing, wholesale, and more. There is a lot of content available for free here on this blog that can help you take your business to the next level as well. We recently published an intro guide to wholesale which you should read now if you haven’t added that as a sourcing method in your business yet. Nick is the COO of the Amazon business talked about on this website. He’s been with the business since 2014 and has helped grow the wholesale sourcing side of the business from zero. In 2018, we did over $2.9 Million in sales of products purchased from our wholesale suppliers. Nick is an expert at what it takes to start sourcing via wholesale, as well as how to scale an Amazon FBA wholesale business to millions in sales per year.